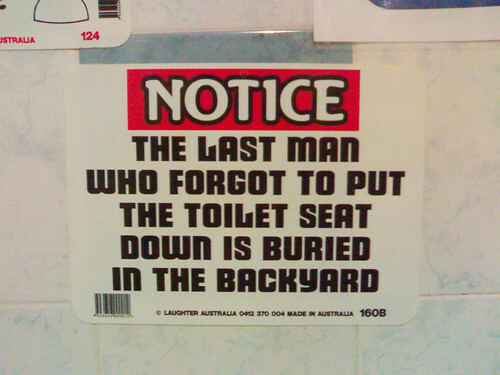 Do you leave your toilet seat up or down? And are you making an optimal choice in that game? Here’s a game theoretic analysis of the situation – may you find some vindication for whatever your preferred behavioral choice is! This entry was posted in behaviour, culture wars, economics, science on June 6, 2007 by Madhusudan Katti. While we are all dumbstruck by the glitzy new creation museum, with its animatronic vegetarian dinosaurs in the garden of eden, the LA Times has a more sobering article on the decline of real natural history museums. You know, the kind where the fancy displays are actually just the public face of the far more important and significant research collections where actual science takes place. The great American natural history museum could be headed for the vulnerable species list, alongside the polar bear and the redwood tree. A national survey last year showed nature museums’ annual bottom lines sinking chronically into the red by $300,000 on average, while art museums outperformed them by nearly half a million dollars. Some of the leading institutions have winnowed their staffs since the decade began, among them the Natural History Museum of Los Angeles County. Science leaders worry that financial pressures and demands to boost attendance could prompt natural history museums to self-lobotomize, cutting away brain matter — the pure scientific research that’s largely hidden from the public — to save the exhibits and educational programs that are the institutions’ visible cash generators. The kind of science where the goal is not to merely present a diorama of a dogmatic belief from a single ancient text, but to actually test hypotheses about evolutionary change. Research is what makes natural history museums special: the mandate to venture into nature and bring back new finds and fresh questions, while maintaining millions of specimens. Some scientists say that amid global warming and a rapid die-off of species, these collections encompassing the world’s life forms, living and extinct, have become especially valuable for the clues they might hold. How have creatures through the eons adapted or failed as their environments have changed? What’s happening now? Biologists say those questions are vital in coping with today’s challenges, and they can’t be answered fully without museum collections. Given the pace of global warming and the necessity to sharpen our abilities to predict how organisms may respond to rapid climate change, museum collections play a much more significant role – and one that even many academic biologist do not quite appreciate. Universities aren’t a strong alternative, scientists say, because many have given up their expensive-to-maintain natural history collections and focused their efforts elsewhere, including biomedical research, genetics and technology. And I’m sorry to say that my own department here at Fresno State is part of this trend. Our small but potentially significant vertebrate collection and herbarium have some rare early specimens from the local Sierra Nevada mountains that could play a role in understanding some of the ongoing shifts in elevational range and phenologies in the region. But we too don’t have the money to properly maintain these as active collections, and it is very difficult to justify hiring full-time curatorial staff (or even a faculty member with part-time curatorial duties) when these resources are not seen to be “productive” – i.e., generating dollars (research grants / donations). Why is it that these natural history museums have been bleeding red ink lately even as art museums seem to have outperformed them? And let’s not even bring up the nauseating millions of dollars that charlatans like Ken Ham rake in for their scam “museums”. Is this just a coincidence or part of the collateral (or direct) damage from the republican war on science? How does one stop the death spiral of dollar cutbacks forcing research cutbacks which further reduce the inflow of new grants? Joel Martin, the crustaceans curator [@ the L.A. Museum], who has been at the museum nearly 20 years, worries that with every cutback, the chances to win grants worsen. Ambitious research often depends on scientists being able to win highly competitive grants from outside sources. “They’re not likely to put a lot of money into an institution that itself is not funding it,” he said. In the three years before 2003, the L.A. museum landed $2.4 million from the National Science Foundation. In the three years since, L.A.’s share dropped to $1.6 million. Perhaps the science museums also need to re-frame themselves to maintain support from a jaded public as the LATimes suggests. Experts even worry that the very name “natural history museum” has a Victorian tinge that makes it harder to compete for audiences and funding. “It harks back 300 years and doesn’t resonate anymore,” said Krishtalka, the University of Kansas museum director who reclassified his venue as a “biodiversity institute.” The challenge and potential salvation, he believes, lie in making visitors and donors understand the connection between the fate of the Earth and all those seemingly inert specimens tucked into drawers or arrayed on back-room shelves in jars of alcohol. Perhaps this is a short-term dip and one that will be reversed by the brand new California Academy of Sciences which will reopen to the public next year. A completely rebuilt California Academy of Sciences is due to open next year in San Francisco’s Golden Gate Park. The museum, which will have a “living roof” of greenery designed by Renzo Piano, could be the canary in the coal mine. If a leading institution that has had a chance to reinvent itself with almost half a billion dollars can’t score a hit, the future for all natural history museums could be a real dodo. The new museum, he said, aims to stay fresh by uniting its public face with its hidden brain, clearly linking research to what visitors see by basing exhibits on the work of the museum’s scientists. For that to succeed, Kociolek said, there has to be a better exchange of ideas within the museum. That’s why Piano was asked to design hallways, office wings and other staff areas so that formerly “siloed” scientists would mingle routinely with colleagues in other departments. Something to look forward to I suppose, even though the cynical realist in me has to wonder about that last part… are we en route to making museum relics out of scientists too by putting them on display, in laboratory dioramas mixed in with all the other exhibits? This entry was posted in education, evolution, science on June 5, 2007 by Madhusudan Katti. Blog yer theses, ye grad students! So you grad student bloggers here have been slacking off, eh? It better be for good reasons – like, you know, that you are busy doing your research and/or writing your thesis! But guess what, just because you are writing your thesis may no longer be a good enough reason to stay away from blogging. In fact, you could emulate this example and actually be editing your doctoral thesis in a blog or your masters thesis in a wiki! Talk about getting help from that global village… and open-sourcing science. Also note that this may not prevent you from publishing your masterpiece in Nature and other fine journals either. This entry was posted in blog, education, science on June 5, 2007 by Madhusudan Katti. In case any of the 7 loyal readers of this blog are wondering – we’ve been slow to update lately for several reasons: first, the semester is over so the students, being no longer required to blog, are obviously slacking off (so I may have to bump them off this blog!)! And as for me, I have a bunch of things I want to share here, but haven’t been able to because first my laptop, and then my body gave out during the last week of what had been an insanely busy semester! The laptop hard drive gave out first, and it took me a while to recover most of the data from it, including all the photos from the bioblitz (which I have still to report on here, I know! ), and I don’t have the laptop back yet from repairs. As I burned the midnight oil during finals week recovering data off the drive, some mysterious debilitating illness got a hold of me and has since had my sinuses (all around my skull it seems) clogged up, lymph nodes swollen, and every muscle apparently laden with some weight and/or rendered gelatinous, so I have felt extremely lugubrious for the best part of two weeks now. The doctor is a bit mystified, for despite a bunch of tests there is no clear diagnosis nor response to various meds tried so far. Perhaps I need Dr. House? Or, i hope, it might all be simply my body protesting all the abuse of the academic year, and refusing to do anything further without a vacation! So, I’ve been trying to lie low, and catch up on some reading. 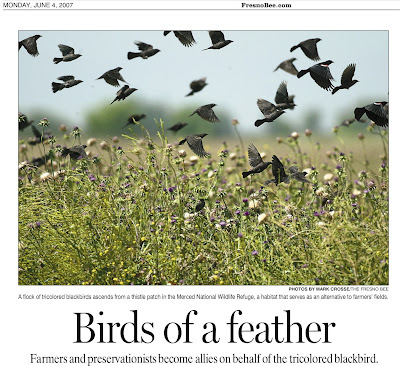 Farmers and preservationists become allies on behalf of the tricolored blackbird. Scientists estimate 140,000 tricolored blackbirds — perhaps half of the species’ world population — descended last year on a Kern County field of hybrid wheat and rice. To the chagrin of the farmer, the 75-acre field became an avian mega-nursery. Instead of harvesting the crop as silage for dairy cows, he sold it to the government for its market value of about $85,000, averting a wildlife disaster and a public relations nightmare. If harvest machines had gone through the crop, they would have left a bloody killing field for tricolored blackbird chicks. It would have been a stunning setback for this closely watched species. The near miss illustrates a nervous turf conflict between these California-based songbirds and farmers — specifically, dairy farmers. Once numbering in the millions, tricolored blackbirds have dwindled to a population of about 250,000 to 300,000. Their historic breeding grounds, the coastal wetlands and the inland marshes of Central California, have largely disappeared as development and agriculture spread over the past century. They still nest in the Central Valley’s remaining freshwater marshes among the cattails when they can find them. But now they find attractive grain fields to breed, alfalfa fields with lots of bugs to eat and dairy grain stockpiles to fill other dietary needs. They do not generally nest in cities. Tricolored blackbirds are among the most colonial birds in North America, which means they breed in groups of thousands of birds. It is not unusual to see 30,000 in a single farm field. Nowhere is this farm-bird conflict more apparent than in the San Joaquin Valley, where mom-and-pop dairies have grown into a multibillion-dollar industry. “You can understand why the birds might be considered a pest by dairy owners,” said tricolored blackbird researcher Robert Meese of the University of California at Davis. Still, farmers are trying to be friends of the blackbird. They do not want to see this bird’s population sag low enough to trigger Endangered Species Act protections, which might force expensive farming restrictions. Farmers and environmentalists — often adversaries over wildlife issues — have joined in an unusual alliance with government wildlife agencies and scientists to work on the blackbird problem. A San Francisco-based environmental group called Sustainable Conservation is credited with organizing the effort in the past few years to come up with a protection plan. Officials with the California Farm Bureau Federation, the state’s largest farm organization with 92,000 members, agree the approach makes more sense than invoking the Endangered Species Act. Now isn’t that an encouraging story from this agricultural heartland of California? Read the rest of the story on the Bee website – or ask me for the full text in case it disappears behind the pay firewall at the paper. This entry was posted in agriculture, conservation biology, reconciliation on June 5, 2007 by Madhusudan Katti. Press coverage of SREL’s situation continues to grow–see the 22 May story in The Chronicle of Higher Education, the 31 May note in Nature, and coverage on the Daily Kos from 18 May. Coverage of SREL’s story is growing, thanks to YOUR support. Some press reports have indicated that SREL will be funded at least through the month of June…while this may provide a short reprieve for beleaguered SREL staff, SREL still has not received a long-term funding promise from DOE. Thus, we urge all Friends of SREL to continue to do all you can to ensure that SREL endures. Go read the rest of the action alert and keep up the drumbeat! This entry was posted in Uncategorized on June 1, 2007 by Madhusudan Katti.